England; Late 13th Century. Latin Text; Angular Gothic Script. Illuminated Psalters occur as early as the 8th century, and from the 9th to the beginning of the 14th century they predominate among illuminated manuscripts. About 1220 A.D., portable manuscript volumes supplanted the huge tomes favored in the preceding century. This change in size caused the creation of a more angular and compact script. In general, smaller initial letters were used, and writing was done in double columns. At this time the pendant tails of the initial letters are rigid or only slightly wavy, with a few leaves springing from the ends. Later, they became free scrolls, with luxurious foliage, and were extended into all the margins. The blue and lake (orange-red) color scheme with accents of white is a carry-over from the Westminister tradition which prevailed in the previous century. The solid line-filling ornaments at the ends of the verses were a new feature added in the second half of the 13th century. Silver and alloys of gold are used on this leaf. The vellum of this leaf was once nearly white, but now appears dirty. 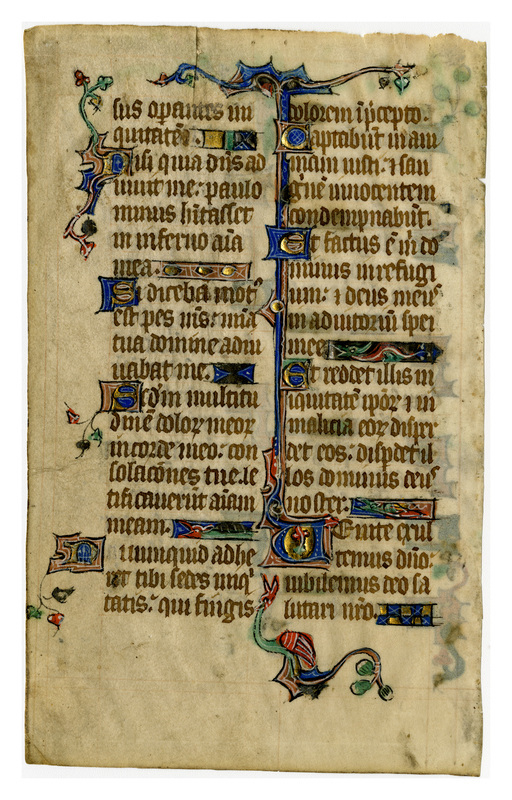 The ink for the bulk of the text is brown, with blue, orange (or weak red), green, and white in the decorations. The silver has tarnished. There are dragons, foliage, flowers, and pointed ivy as marginal decorations. Illuminated initials begin each verse, and bars are placed at the end of lines to complete them when the text is too short to fill them; these lines include both geometric designs and additional dragons. Text: Psalms 93:6-16 (recto) and 93:16-94:1 (verso). 300 dpi JPEG; 17 x 11 cm. ...against the workers of iniquity? 17 Unless the Lord had been my helper, my soul had almost dwelt in hell. 18 If I said: My foot is moved: thy mercy, O Lord, assisted me. 19 According to the multitude of my sorrows in my heart, thy comforts have given joy to my soul. 20 Doth the seat of iniquity stick to thee, who framest labour in commandment? 21 They will hunt after the soul of the just, and will condemn innocent blood. 22 But the Lord is my refuge: and my God the help of my hope. 23 And he will render them their iniquity: and in their malice he will destroy them: the Lord our God will destroy them. Et dixérunt: Non vidébit Dóminus, nec intélliget Deus Jacob. Intellígite, insipiéntes in pópulo; et stulti, aliquándo sápite. Qui plantávit aurem non áudiet? aut qui finxit óculum non consíderat? Qui córripit gentes non árguet, qui docet hóminem sciéntiam? Dóminus scit cogitatiónes hóminum, quóniam vanæ sunt. ut mítiges ei a diébus malis, donec fodiátur peccatóri fóvea. Quoadúsque justítia convertátur in judícium: et qui juxta illam, omnes qui recto sunt corde. Nisi quia Dóminus adjúvit me, paulóminus habitásset in inférno ánima mea. Si dicébam: Motus est pes meus: misericórdia tua, Dómine, adjuvábat me. Secúndum multitúdinem dolórum meórum in corde meo, consolatiónes tuæ lætificavérunt ánimam meam. Captábunt in ánimam justi, et sánguinem innocéntem condemnábunt. Et factus est mihi Dóminus in refúgium, et Deus meus in adjutórium spei meæ. Et reddet illis iniquitátem ipsórum, et in malítia eórum dispérdet eos: dispérdet illos Dóminus Deus noster. 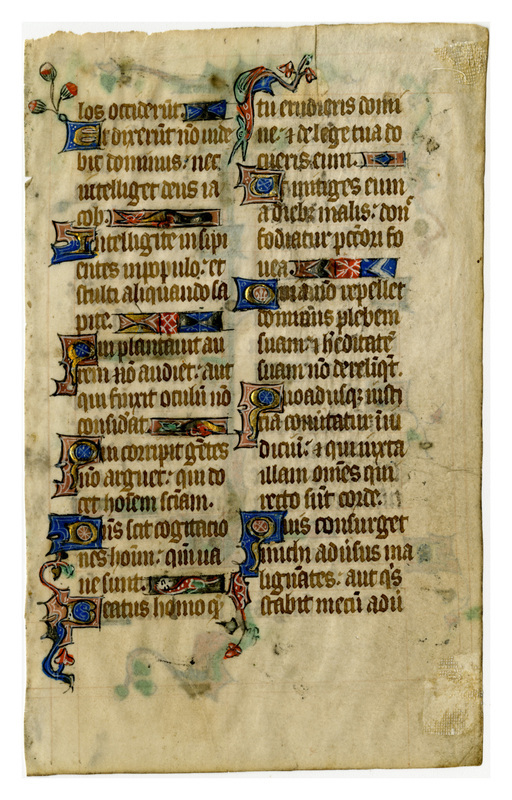 “E0017 Leaf from a Psalter (Psalterium),” Digital Exhibits | Denison University Archives & Special Collections, accessed April 23, 2019, http://exhibits.denisonarchives.org/items/show/40.